vehicles. If vehicle is operated under severe service conditions, see SEVERE SERVICE REQUIREMENTS (PERFORM W/SERVICE SCHEDULES) for items requiring additional maintenance. information. Fluid types and capacities listed with each service in this article are only those necessary to perform that scheduled service. For specifications pertaining to fluid capacities for the entire vehicle, fuse and circuit breaker identification, wheel and tire size, battery type, warranty information, or model identification refer to the MAINTENANCE INFORMATION article in this section. NOTE: See the AIR BAGS article in the ACCESSORIES/SAFETY EQUIPMENT Section. Modifications or improper maintenance, including incorrect removal and installation of the Supplemental Restraint System (SRS), can adversely affect system performance. DO NOT cover, obstruct or change the steering wheel horn pad in any way, as such action could cause improper function of the system. Use only plain water when cleaning the horn pad. Solvents or cleaners could adversely affect the air bag cover and cause improper deployment of the system. WARNING: To avoid injury from accidental air bag deployment, read and carefully follow all warnings and service precautions. See appropriate AIR BAGS article in ACCESSORIES/SAFETY EQUIPMENT. 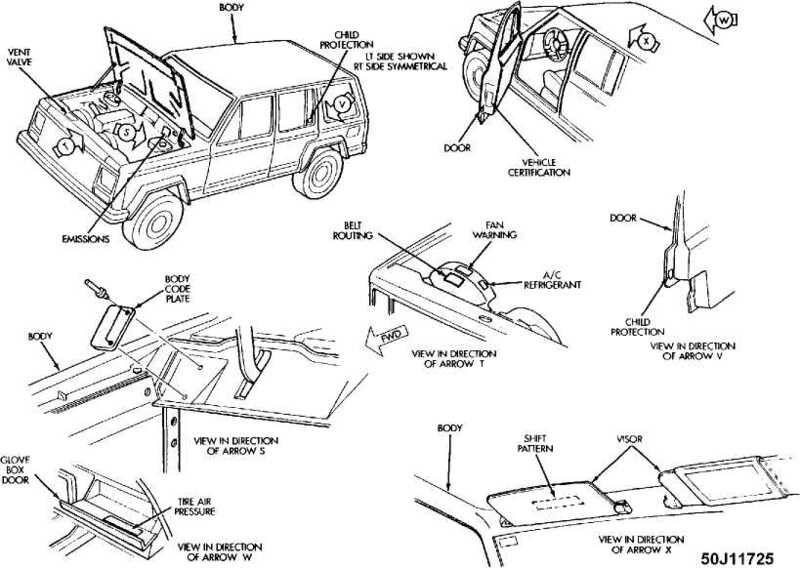 WARNING: The Air Bag System installed on 1995 Cherokee models is a sensitive, complex MECHANICAL unit. Before attempting to remove or install the airbag system or related steering wheel and steering column components you MUST FIRST DISARM the AIR BAG firing mechanism. Failure to follow these procedures could result in accidental deployment and personal injury. WARNING: The air bag module inflator/sensor assembly contains sodium azide and potassium nitrate. These materials are poisonous and extremely flammable. Contact with acid, water or heavy metals may produce harmful & irritating gases or combustible compounds. DO NOT attempt to dismantle the module or tamper with its arming lever. DO NOT attempt puncture, incinerate, or bring into contact with electricity. DO NOT store at temperatures exceeding 200 F.
Chrysler Mopar parts catalog only. DO NOT mix components in this mechanically-fired airbag with components from ANY electrically-fired airbag system. WARNING: The fasteners, screws and bolts used in this air bag system have a special coating on them and are specifically designed for use with this air bag system. DO NOT use any kind of substitute. WARNING: NEVER add A/C refrigerant to correct a non-cooling problem unless pressure gauges are connected to the system by a certified technician. Lack of cooling may be caused by a restriction, therefore adding refrigerant can cause a dangerous pressure rise. CAUTION: Avoid breathing R-134a refrigerant and PAG lubricant vapors, exposure may irritate eyes, nose and throat. To remove R-134a from system use R-134a recycling equipment that meets SAE J2210 specifications. If accidental system discharge occurs, ventilate work area before resuming service. WARNING: R-134a service equipment or vehicle A/C systems SHOULD NOT be pressure tested or leak tested with compressed air. Some mixtures of air/R134a have shown to be combustible at elevated pressures. These mixtures are dangerous and may cause fire and/or explosions. See AIR CONDITIONING SERVICE article in GENERAL INFORMATION section. The anti-lock brake system contains electronic equipment that can be susceptible to interference caused by improperly installed or high output radio transmitting equipment. Since this interference could cause the possible loss of the anti-lock braking capability, such equipment should be installed by qualified professionals. original diameter, increasing the width is acceptable. fluids in an ABS-equipped vehicle. WARNING: When battery is disconnected, vehicles equipped with computers may lose memory data. When battery power is restored, driveability problems may exist on some vehicles. These vehicles may require a relearn procedure. See COMPUTER RELEARN PROCEDURES article in GENERAL INFORMATION section. Before replacing a blown fuse, remove ignition key, turn off all lights and accessories to avoid damaging the electrical system. Be sure to use fuse with the correct indicated amperage rating. The use of an incorrect amperage rating fuse may result in a dangerous electrical system overload. Indicator will cause a squealing or scraping noise, warning that brake pads need replacement. CAUTION: Any time a hydraulic brake part is removed and/or replaced, the brake system MUST BE flushed. For more information regarding brake maintenance refer toBRAKE SYSTEM article. CAUTION: If BRAKE warning light is on with parking brake disengaged and engine running, there may be a problem in the hydraulic brake system. Braking effort, brake pedal travel and stopping distances may increase. To prevent catalytic converter overheating, DO NOT allow engine to idle for more than 20 minutes. To avoid possible damage to vehicle use only ethylene-glycol based coolants with a mixture ratio from 44-68% anti-freeze. DO NOT use 100% anti-freeze as it will cause the formation of cooling system deposits. This results in coolant temperatures of over 300 F (149C) which can melt plastics. 100% anti-freeze has a freeze point of only -8В° F (-22C). Propylene-Glycol -26 F (-32C) - 257 F (125C) Ethylene-Glycol -35 F (-37C) - 263 F (128C). CAUTION: Propylene-Glycol/Ethylene-Glycol Mixtures can cause the destabilization of various corrosion inhibitors. Also Propylene-Glycol/Ethylene-Glycol has a different specific gravity than Ethylene-Glycol coolant, which will result in inaccurate freeze point calculations. hard-surfaced roads for a sustained period. Use 4L only when needed for added pulling power. Operating vehicle in 4WD mode on such roads will cause stress and possible damage to components, as well as make shifting difficult. To reduce shifting effort, drive vehicle in Reverse for a few feet, or drive off hard-surfaced road momentarily to allow tire slippage. CAUTION: DO NOT use water, steam, kerosene or gasoline for flushing a differential. ONLY use a flushing oil. CAUTION: DO NOT flush a rear axle Trac-Lok differential. Trac-Lok differentials may be cleaned only by disassembling the unit and wiping the components with clean, lint-free cloth. CAUTION: NEVER attempt to engage Low range when vehicle is moving faster than 2-3 MPH, as transfer case damage may result. CAUTION: Exclusive use of gasohol is not recommended. Vehicle test results have shown that significant fuel system corrosion can result when gasohol is used exclusively. WARNING: Halogen bulbs contain pressurized gas which may explode if overheated. DO NOT touch glass portion of bulb with bare hands. Eye protection should be worn when handling or working around halogen bulbs. CAUTION: Fuel that is more than 5% methanol should not be used in this vehicle. It can corrode metal parts in the fuel system, and damage plastic and rubber parts. Even at 5% methanol or less, solvents and corrosion preventers must be used with this fuel to avoid these problems. filter with improper threads can result in oil leakage and possible engine damage. Look for M20 x 1.5 symbol on the filter. radiator fan. The fan is temperature controlled and could start at any time even when the ignition key is in the OFF position. DO NOT loosen or remove radiator cap when cooling system is hot. WARNING: Keep hands away from radiator fan. result in false speedometer and odometer indications. Check with dealer before using different size tires on vehicle. CAUTION: Ensure all 4 wheels on vehicle have same tire size, type and circumference in order to provide proper vehicle handling. DO NOT mix radial-ply with bias-ply or bias-belted tires. On 4WD vehicles, if tire size, type and circumference on all 4 wheels are not the same, gear shifting will be adversely affected and can damage transfer case. NOT drive vehicle faster than 50 MPH or more than 100 miles when using spare tire. DO NOT operate vehicle in 4WD mode when using spare tire, as damage to transfer case can result. Temporary-use spare tires have a total tread life of 3,000 miles. WARNING: DO NOT leave vehicle unattended with transfer case in Neutral without fully applying parking brake. Transfer case Neutral position disengages both axles and will allow vehicle to move regardless of transmission position. CAUTION: Never attempt to engage Low range when vehicle is moving faster than 2-3 MPH (3-5 KM/H). Transfer case damage may result. CAUTION: DO NOT operate vehicle in Low range for extended periods on dry, hard surfaced roads. Damage to components and hard shifting may result. Spark plug replacement intervals, if given, are for Original Equipment Manufacturer (OEM) installed or specified plugs. If vehicle is equipped with platinum type or other non-OEM type spark plugs, follow replacement interval specified by spark plug manufacturer. If vehicle is equipped with an oxygen sensor, replace at 82, 500 miles or when the emissions maintenance reminder light remains on continuously with the key in the ON position, whichever occurs first. Fig. 1: Service Point Locations (Typical) Courtesy of Chrysler Corp. Fig. 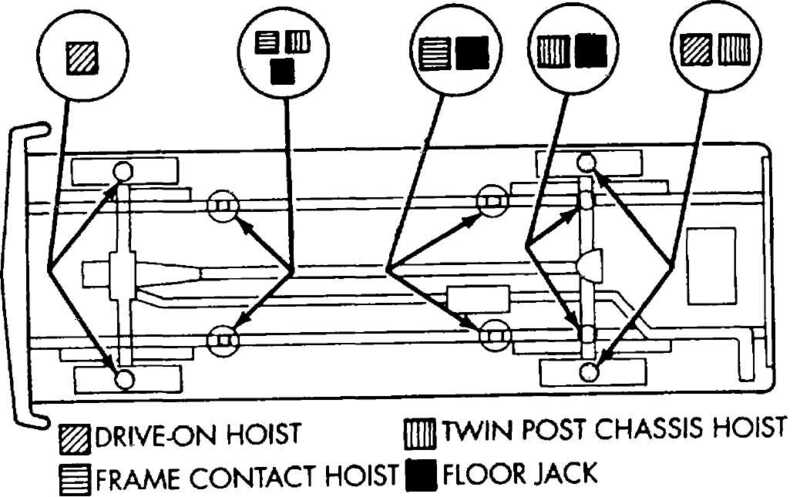 2: Hoist Lift Point Locations Courtesy of Chrysler Corp. Fig. 3: Brake Caliper Lubrication Points Courtesy of Chrysler Corp. 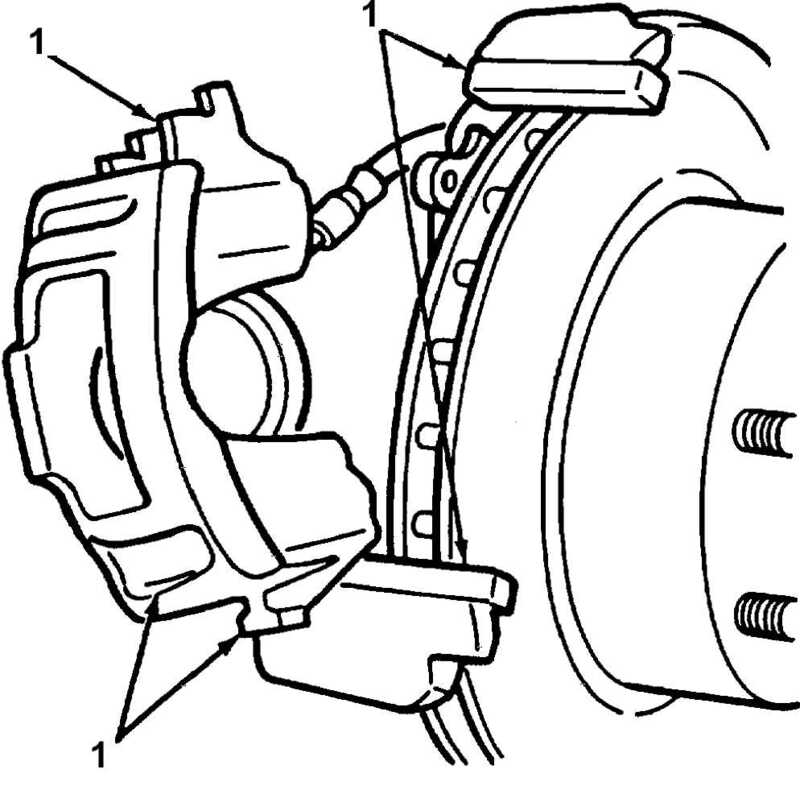 NOTE: For more information regarding brake maintenance refer to the BRAKE SYSTEM article in the BRAKES section. Fig. 4: Front Disconnect Housing Lubrication Point Courtesy of Chrysler Corp. Fig. 5: Identification Label Locations Courtesy of Chrysler Corp.
subjected to severe service. See SEVERE & NORMAL SERVICE DEFINITIONS. This service is to be performed in addition to the normal services listed in the NORMAL MAINTENANCE SERVICE SCHEDULES. (1) - Perform these services at the mileage or number of months (since the last time), whichever comes first. under normal operating conditions. For vehicles driven under severe conditions, additional services may be necessary. See SEVERE SERVICE REQUIREMENTS (PERFORM W/SERVICE SCHEDULES) above in this article for additional service requirements. - DO NOT use Dexron-II ATF, Clutch chatter can result. - SAE 10W-30 SH/CD is preferred. engagement difficulties, use only SAE 80W-90 lube. use SAE 75W-140 Synthetic lube. NOTE: Before using SAE 75W-140 Synthetic, old fluid must be DRAINED and FLUSHED with clean mineral based (non-synthetic) axle lubricant. Then refill with new synthetic lube. - Use low pressure grease gun to prevent seal damage. - Fill until lubricant squeezes out from the base of seals. - Fill ball joint until seal starts to swell. dipstick (if available) to measure level. (8) - Fill ball joint until seal starts to swell. check dipstick and fill to proper level. - Includes 2.3 qts. (2.2L) for coolant recovery bottle. - Includes 1.0 qt. (0.9L) for coolant recovery bottle. - Fill to bottom edge of filler plug hole. - Add 5 ozs. of gear lubricant through indicator switch hole. differential lubricant additive first, then add new fluid. (1) - Add .6 hr. for vehicles equipped with 4WD. (6) - Use low pressure grease gun to prevent seal damage. (1) - Replacement is recommended by Chrysler at this time, but it is not required to maintain the warranty on the PCV valve. (2) - Check and replace as needed. (1) - Add .6 hour for vehicles equipped with 4WD. is not required to maintain the warranty on the PCV valve. - Check and replace as needed. (2) - Check and replace as needed. - DO NOT use Dexron-III ATF, Clutch chatter can result. NOTE: Before using SAE 75W-140 Synthetic the old fluid must be DRAINED and FLUSHED with clean mineral based (non-synthetic) axle lubricant. Then refill with new synthetic lube.